Not all men are created equal, and neither are dentists. If you just left your last dental appointment and it was handled with almost professional, clinical detachment, in an assembly line atmosphere, I know that you didn’t visit Dr. Christopher Thompson at Thompson Dental at Trinity. Conveniently located just off Hwy 54, at 2202 Duck Slough Blvd in Trinity, this full-service general dental practice is what you have been looking for. Can you say friendly-family atmosphere with caring, helpful staff in comfortable, welcoming and recently redecorated surroundings? You just described Dr. Thompson’s dental practice. They accept most dental PPO’s and are just waiting to assist your every dental need. A native Floridian, born and raised in New Port Richey, Dr. Thompson was educated initially at Florida State University and then the University of Florida College of Dentistry. Dr. Thompson was originally unsure about which field of medicine he wanted to study. Having been exposed to dentistry most of his life, by his father, a recently retired local dentist, Dr. Thompson chose to follow in his footsteps and completed his degree in dentistry, serving the needs of his community for more than 14 years now. Part of the difference that you will experience with Dr. Thompson is time; he listens, getting to know both his patients and their dental needs. Each treatment plan is customized carefully, only after considering the patients wants, needs and financial considerations. As Dr. Thompson says, some patients want “Hollywood veneers” while others are more interested in function than cosmetics. His practice effectively meets both of those needs and more. Have you ever heard of CEREC? It is the wave of the future in dentistry, a cutting edge, a state-of-the-art system already in use for Dr. Thompson’s patients. Gone is the need to have a temporary crown and having to come back again, before a damaged or decayed tooth is restored. That messy fitting inconvenience is gone! Remember the dentist’s admonition not to bite down on anything hard for several hours with your silver amalgam filling; no longer necessary. 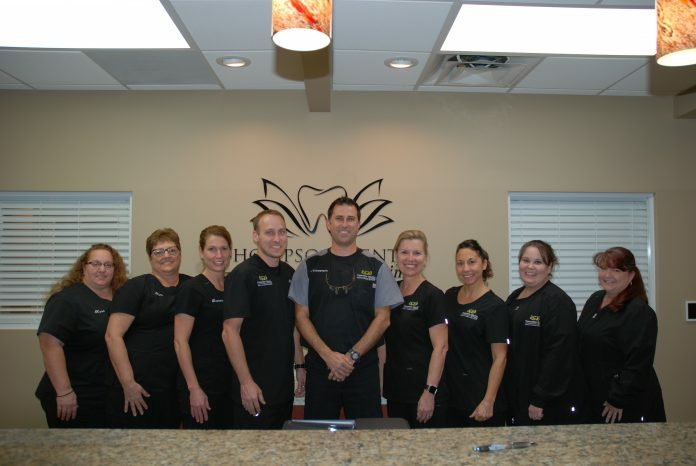 Dr. Thompson is one of those few forward-thinking dentists in the Trinity area who employs The CEREC restoration process, completed in a single day! Once all decay is removed from a designated tooth, he shapes it, in preparation for a 3D digital picture, allowing the patient to participate in the design of their own tooth. The machine mills the restoration which is glazed in a special onsite oven. Dr. Thompson then inserts the finished restoration, made of compressed porcelain, stronger than laboratory-made layered porcelain; total time involved, about an hour and a half! The process can also be used for cracked or chipped teeth as well as creating veneers, crowns, inlays, and onlays. Dentistry has come a long way and Dr. Thompson happily makes these advances available to his patients every day. Dr. Thompson’s practice consists of 4 elements: cosmetic, restorative, preventative and pediatric. A family man himself with 4 children, Dr. Thompson noted that the old wives’ tale that you shouldn’t bring your child to the dentist until he/she is at least 7, is just that … an old wives’ tale! Imagine what a traumatic experience it would be for a 7-year-old with cavities, visiting a dentist for the first time, having to undergo drilling and filling. What kind of an impression would that make on an innocent child? How likely would that traumatized little one be to continue their dental care as they matured? Dr. Thompson stressed that early pediatric intervention and parental training can create healthy teeth and a winning smile that can last a lifetime. Need a deep cleaning or whitening of your “pearly whites” that have been accidentally discolored from eating certain foods, smoking or any of the many other available tooth discoloring options? Bring them to Thompson Dental at Trinity and get your smile back. Crowns, fillings, extractions, bridges and even root canals and dentures are expertly handled by Dr. Thompson and his professional staff. These are only a few of the many general dentistry options available at Thompson Dental at Trinity. Big or small, 1-year-old or 100-years-old, if it is dental related, Dr. Thompson treats them all. Call for your appointment today, 727 375 2000, 2202 Duck Slough Blvd., Ste 104 and get your smile back! DIRECT-﻿MAILED TO OVER 130,OOO HOMES MONTHLY! Tampa Bay News & Lifestyles is the Premier shop local publication for the West Central Florida area. This award-winning community magazine is direct mailed to over 130,000 homes spread across 18 zip codes in Trinity, East Lake, Odessa/Lutz/Land O' Lakes, Westchase, Carrollwood, New Tampa, and South Tampa. © 2018 Tampa Bay News & Lifestyles Magazine. All Rights Reserved.